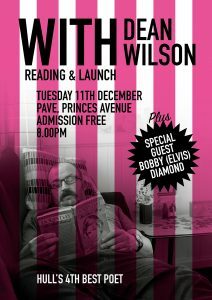 A new collection of 11 poems by Dean Wilson will be launched on Tuesday 11th December. WITH, a large format magazine, is published by Wrecking Ball Press. The poems within were all written in the East Yorkshire coastal town of Withernsea, where Dean has a cliff-top chalet. The collection is subtitled You’re Sad And Lonely And You’re Coming With Me and comes in a goodie bag packed with surprise seaside-related gifts. Design of WITH is by Human Design, with photographs by Graham Scott. 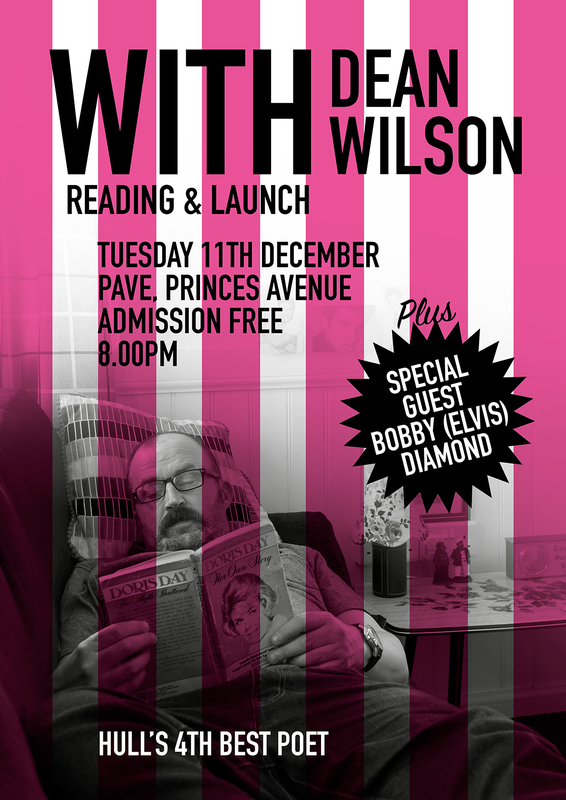 The launch takes place at Hull’s Pave, at 8pm (free entry), where Dean will be joined by Elvis impersonator Bobby Diamond for an evening of fun that also includes a raffle. Copies of WITH will be available on the night or can be pre-ordered here. Love, music, the Holocaust, and a dog called Mango.